Fix Issue #96: page 100 is not downloaded for new illust page. Implement Feature #95: dump url list to text file. Set writeUrlInDescription = True to enable. Set urlBlacklistRegex to define url to ignore. 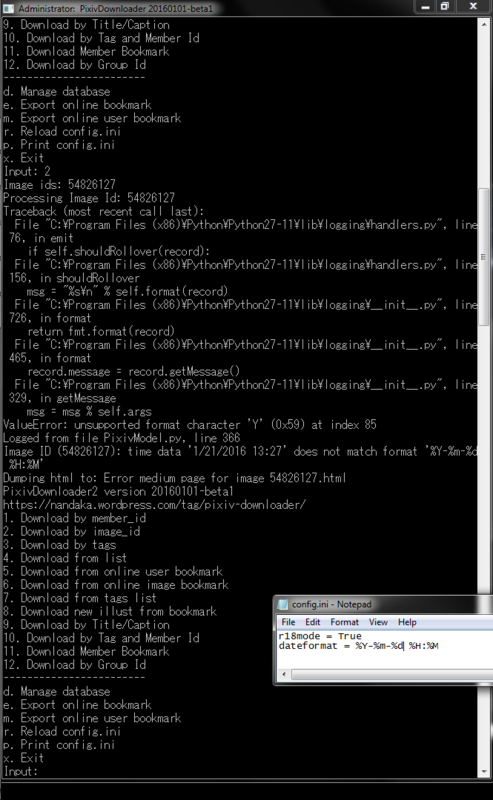 Set urlDumpFilename to define the dump filename, use python strftime() format. Download link for pixiv downloader 20151112, source code in GitHub. This is so neat, thank you nandaka! Nah, they’re not private. Just that pixiv f*cked up after I renamed in English some tags. After I renamed a Ragnarok tag all those illust don’t appear while browsing the basic bookmarks page, but only when I browse the Ragnarok tag. It’s ok, I think I’ll mess a bit with the code so that the URL from which it downloads to contain a “?tag=whatever”. Damn I’m such a n00b. No idea which file to edit. I suppose it’s something in library.zip but I don’t really know which one. Will post a request on github. well, library.zip only contains compiled python script (pyc). Unless you run from the script, then it might be difficult to do it. Thanks again for the program and your fast replies! what I can suggest is to change your locale to Japanese Shift-JIS. Thanks, typing “chcp 932” allows it to run under window’s cmd, though not through its own GUI. Well, take what you can get, i guess. Attempting to force cmd to autorun chcp doesn’t work for running the exe outside cmd. you can set the regional settings for non-unicode to Japanese or change the default codepage for CMD in properties to Japanese. It looks like the application fails to recognise cp65001 as utf8, this seems to be a common problem with python 2.7. But what if an artists uplaods 2 images with the same tags in the same day? Would I download them both or would it skip one of them? depends on the config, it may either skip (file already exists) or overwrite (different file size). You better add the image id to make sure the filename is unique. In config.ini, what do I type in the ‘dateformat =’ line to make the date go YYYY-M-D ? Nothing I have tried so far works. English or Japanese. Refer to http://strftime.org/ for syntax. Am I just being an idiot by leaving something out/getting the format wrong? the dateformat settings is for the pixiv parser, not for the filename. Hello! Two questions need your help. In “config.txt”, what are ” daylastupdated = 7 ” and ” checkupdatedlimit = 0 ” means. How to copy the log which have downloaded and can use on last version pixiv downloader. To avoid download again when I use new pixiv downloader. 2. Just extract the new release to the same folder (backup your config.ini and db.sqlite, just in case). As long alwayscheckfilesize = False and overwrite = False, it will skip the image if already downloaded. Let me know if you want the description or any other details changed. Can you add link to my wordpress url? I have your wordpress as the “software site”, which is on the left of the page. 2016-01-09 17:22:13,608 – PixivUtil20151112 – INFO – tags mode. Same thing with DIO花 tag. What can cause this problem? I use Windows 7 and PxivDownloader version from comment 58 here. 1. Looks like the tags is encoded twice. Either you set the language for non-unicode to Japanese in control panel, or try to prefix with space when entering the tags? 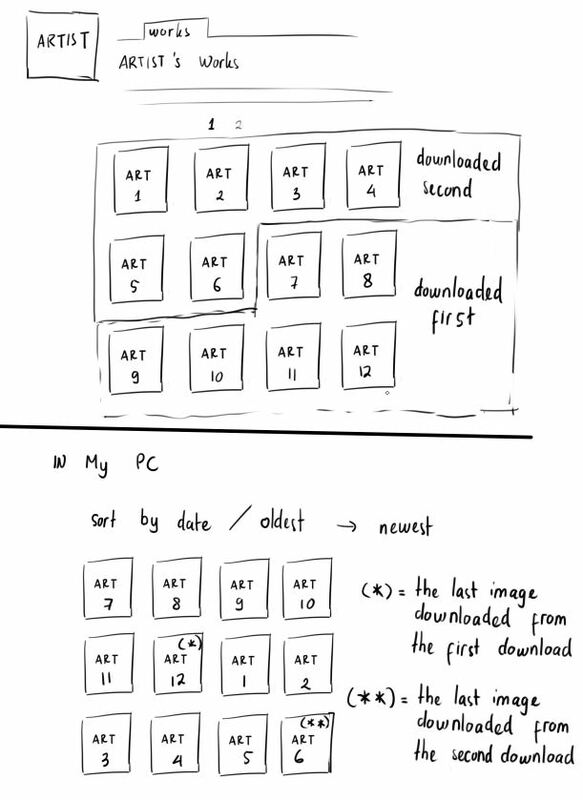 2. start = older date (e.g. 2015-12-01), end = recent date (e.g. 2016-01-01). Heyo! Just a quick question, is it possible to set it up so that it would only download the R-18 images from specific artists? For example I have about 65 artists that I only want to rip the R-18 tagged images from, however I have about 200+ artists that I want ALL the images from. Is it possible to do this? The only workaround I can think of is having two separate PixivDownloader folders with two different config files. u better use 2 separate PixivDownloader folders. but nothing happens. It just returns me to a blank input. I’ve added my login details to the config (they work). I’m sorry if this sounds very stupid, but I am very confused. Thank you for the assistance and thank you for creating such an awesome program. Nope, option 10 will download from member Works, not from bookmark. So far it’s working like a beaut. You’re amazing! I don’t know if this was on purpose, but when I did “start page = 1” and “end page = 3”, it went and did my 4th page. Just throwing that out there. Thanks for everything! Have a great new year!! Hello! I love your application, it makes my life waaay lots easier. Not to mention, it free my times too. I’m really surprised that not many of my friend know it. /Tells all of them right after I found and tried Pixiv Batch Downloader/ Thank you so much for making this app. I have a little question and problem. I have a lot of pixiv ID that I want to download from, Pixiv Batch Downloader’s group ID does the job but I do this regularly (to update their recent illustration) that it make me think, is there a way to automatic the process? Thank you! I didn’t realized there’s that way. But I encountered a problem when the task run. Using Shift + Right click on mouse at Pixiv Downloader’s folder and run PixivUtil2.exe -s 10 (pixiv id) 1 0 (tag in japanese), works. (no fails log like the last comment I give), perhaps this has something to do with my computer..? P.S. I’m running Windows 7. Apologies if this was answered somewhere else, but if the computer crashes and you restart downloading again using “6. Download from online image bookmark” does it redownload everything or does it start where it left off? Is there a command or something to enable the download for both R18 pics and non-R18 pics? Cause as it is, if I want all of the pics from a member_id, I need to download twice. Once with R18 mode on and once without it. Basically a way to download everything from a user/author without it skipping pics, regardless of if they are R18 or not. I want my files to have the work’s date in their name with a “Year-Month-Date” format without the Japanese characters. Is this possible? Editing the “dateformat” just results in an error. Use %date% in the filename format, but this will use YYYYMMDD format without the separator. Either your internet is unstable, or pixiv server disconnect your connection. your internet connection is unstable. Log in using secure form. then the program stops after pressing enter. I think they added a captcha/image verification when you try to log in based on the error message, which is weird because it doesn’t show up when I tried. Can you try cookie login method (check readme.txt for details). Thank you very much, your work is great u can even download the manga section with it, wich is amazing. And also thanks for the quick and clear reply, i wish u the best. i can’t download images. what should i do? Are you running windows? Can you change the Regional Setting for non-Unicode program to Japanese in Control Panel? i using windows 7 and i set the language for non-unicode Program to Japanese. what about your pixiv website settings? Do you set it to either english or japanese? yes… i set it japanese. I want to batch download a lot of illust_id using list.txt, but PixivUtil2 doesn’t recognize the full URL. What can I do to batch download a lot of links at once? no such feature, but you can key in multiple image id using option 2 (separate with space). enableInfiniteLoop ==> Enable infinite loop for download by tags. Only applicable for download in descending order (newest first). other than that, get Pixiv Premium. Is it possible to sort the download backwards from the oldest images to the newest images? nope. Why you want to do that? no need to sort by date, just sort by image id will do. The image id always increase (newer image will have bigger number). I think the root cause is because the application cannot save the file to D:asmy_filesasmy_pixiv, try to change the rootDirectory to the app folder first? The error message failed to decode/encode the filename to log file. have same problem with sun core, tried change root directory in config.ini but didnt help. have same problem with sun core, tried change root directory in config.ini but nothing changed. 2015-11-15 09:17:39,831 – PixivUtil20151112 – INFO – Login successfull. 2015-11-15 09:20:02,863 – PixivUtil20151112 – INFO – Member id mode. 2015-11-15 09:20:46,047 – PixivUtil20151112 – INFO – Login successfull. 2015-11-15 09:21:00,216 – PixivUtil20151112 – INFO – Member id mode. Are you using linux/unix? Cos I’m not sure with linux/unix environment. Do you have unicode support on the terminal? I’m only using windows, and it is working properly. yes using linux, terminal should support it coz can paste hiraganas there. dunno about python tho, using 2.7. 2015-11-15 19:17:35,401 – PixivUtil20151112 – INFO – Log in using secure form. 2015-11-15 19:18:02,497 – PixivUtil20151112 – INFO – Image id mode. weird, it is working properly in my pc. What is the full log file? Try to set the Language for Non-Unicode Program to Japanese.